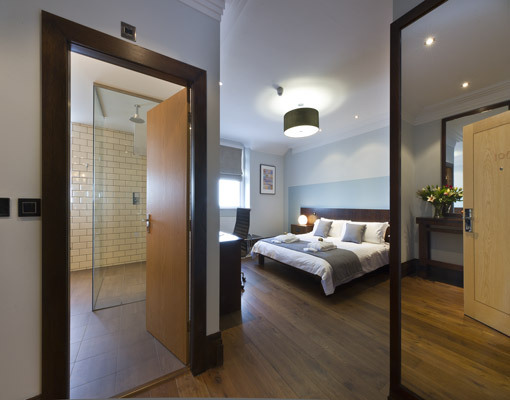 Matthew was commissioned by The Sleepwell Hotels team to design their hotel rooms with a modern Bauhaus feel. He worked closely with the Eclipse Developments team. There is an emphasis on strong clean lines throughout the rooms (Photos 1 and 2) and a dark fumed timber covers the floor. The aim here was to provide both a high-tech and practical space for corporate clients. The bathroom is also in the modern style (Photos 3, 4 and 5). The glass one-piece basins were specified to make servicing as easy as possible.